Fortnite has pets now, so I asked our intrepid ‘shop-savvy readers to put pets in all of the games. I wasn’t disappointed. Pets make the world a special place, and the developers working away on Fortnite clearly know that. The real question, though, is why everyone else does not know that. Thankfully, you all have done an excellent job of pitching “pets in all types of games” to the game development public, and I hope that these ‘shopped images provide a good reason for getting all sorts of animals into all sorts of games. 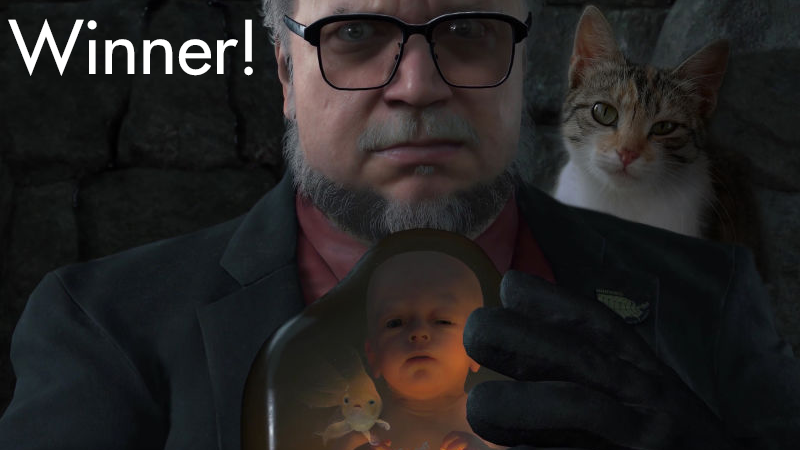 Our winner this week is DrButts311, who wins because the idea of putting a goldfish in the baby carrier thing from Death Stranding is pure genius. That baby needs a friend, and that friend can be a goldfish. That cat is almost certainly going to betray someone here but, well, that’s to be expected. It can’t be a Kojima game without a good betrayal! Our honorable mentions this week are also excellent, and I encourage you to go check out the comments on the original post to see the awesome things that everyone submitted that just didn’t make the cut. FlyingDorkProd is pushing the bounds of “pet” with the inclusion of Snoopy, but I will allow it because he is definitely going to kick all over Sinai in that plane. Bob gave Spider-Man a fun little dog. Good work! Mrichston gave Spider-Man a more...complicated...pet to take care of, but he seems like a responsible young person, so it’ll probably work out. Slinker chose to put that damnable rude dog on this fisher’s back. Mazz found the perfect pet for Rico, a man who flies through the skies with the greatest of ease. Lharm found a slightly less perfect pet for a slightly less perfect guy who doesn’t really fly all that well. Klaatu Barracuda found a perfect place for a pet. A small engineering dog could watch Isaac’s back perfectly! Chelsea of Tranquility found another perfect companion. Done With Kinja has added a pet and his frustrating family to the No Man’s Sky mix. Brian found another anomaly in No Man’s Sky. netsquire has created a horrible scenario for this poor dog. Villings has crowded the arena with too many pets. Chris Mc has identified the one thing that would truly improve the Forza franchise. Jon made a friendly dogman. Damien Fate has created a truly inspired, yet truly horrifying, image of what the King of All Cosmos would do to the pets. rhinoskin found a fun little pup. And that’s it for this week! Join me on Sunday for a brand new ‘Shop Contest and more opportunities to ‘shop things. Thanks for participating everyone! &apos;Shop Contest: Make Sense Of Death Stranding, Winners!